It is much more lightly batted and super crispy compared to KFC. Most of all it is very addictive because of the Yangnyeom sticky sauce which is all of spicy, sweet, tangy, nutty, chewy and sticky. 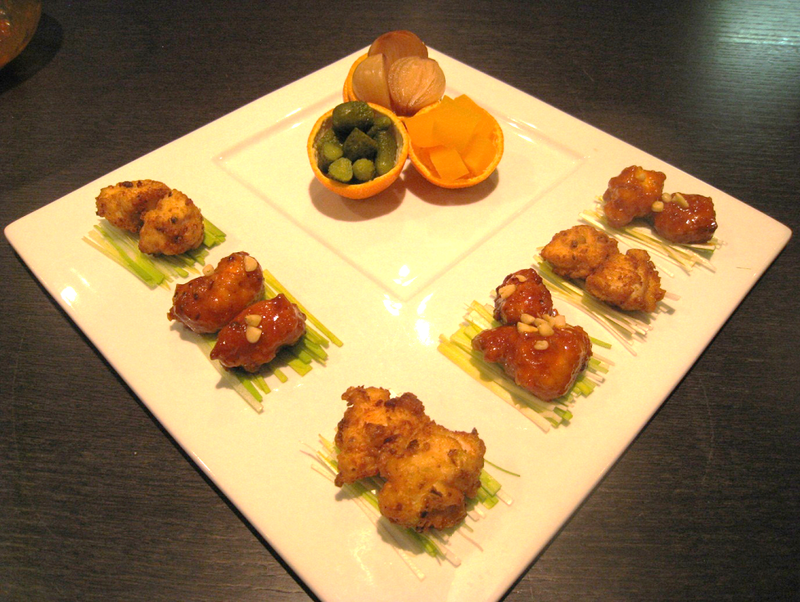 Korean fried chicken typically has layers of thin batter. Despite it being fried food, Koreans try to cut down on their consumption of calories so less batter and thin batter are more attractive. I personally do not like heavily battered fried food either. For this reason I chose a method which does not use water since water leads to a thick batter. Instead I made a dry batter using a little bit of lemon juice and some chopped herbs and vegetables that together produces just enough liquid to lightly coat the chicken breast in flour leading to a thin layer of batter. I also find that the batter flour that I buy from my local Korean supermarket is much crispier than normal flour. 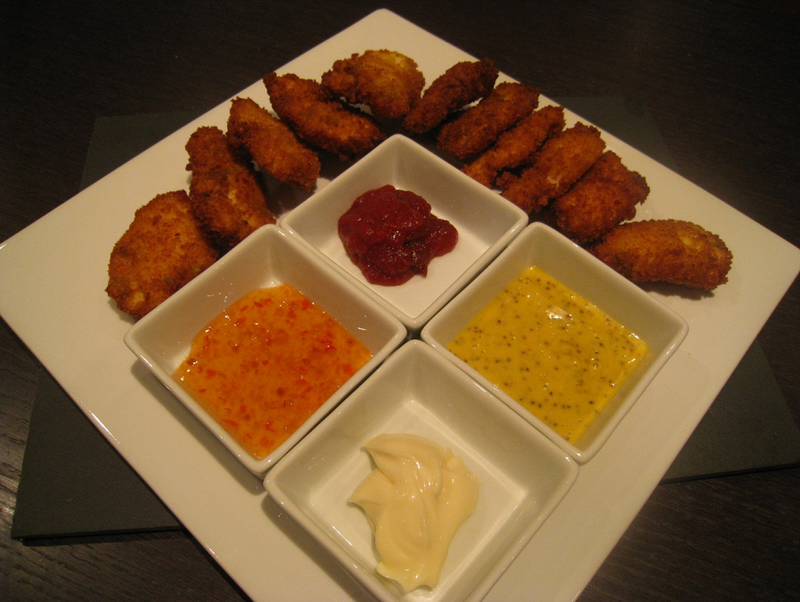 The spicy sauce is very important to the recipe too, but in Korea we are given the choice of having the sauce mixed with the fried chicken or having it separately as a dipping sauce. I have made this sauce five times recently and I am sharing this recipe so I hope you enjoy this most popular dish with a glass of beer. “Yangyeom” and there are many major Korean fried chicken companies that have their own recipes but nevertheless the common taste is sweet and spicy. In Jeolla Province, Korea we often wrap our fried meat and small pieces of vegetables in lettuce leaves before popping them in our mouths so if you struggle to get your children to eat vegetables then you might try this. “Ssam” literally means wrapped in a leaf lettuce such as Oka leaf, Bay leaf, little Gems or even herbs such as flat leaf parsley together with some chives or baked garlic. You really need to try this dish with a glass of beer (a cold lager). How many times now have I mentioned our glass of beer? You are going to love it because this food is so addictive. This dish is dangerously delicious!I wish with my poor English that I could better express this and convince you to attempt to cook this food immediately. Watch out for a very full tummy when you try this delicious, authentic dish. Finely chop all the vegetables mango, (or apple), leeks, shallots, garlic and fresh chilies and place on a plate. Heat a deep pan on a low heat for a minute and add a tablespoon of butter. garlic →shallots→ leeks → mango (or apple)→ chilli into the pan. Turn down the heat to medium to low. 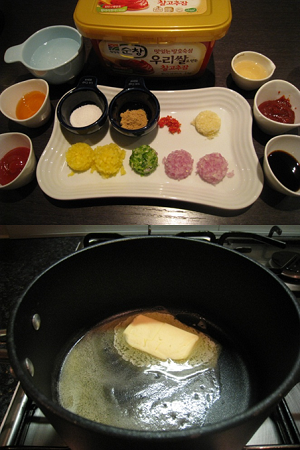 Season the sauce with the Korean chilli paste, ketchup, soy sauce, sugar, ginger, syrup, wine and the 100ml of water. Stir the sauce for 5 minutes on a medium heat. Then simmer the sauce for another 5 minutes on a low heat. Do keep the heat low and stir if necessary to prevent the sauce from burning. You will notice that the sauce becomes light and creamy. Mix separately and thoroughly 1 tsp (teaspoon) of corn flour with 1 tbsp (tablespoon) of cold water then add to the simmering sauce and stir for another two minutes. Now our Korean fried chicken spicy, sweet and tangy sauce is completed. Tip. We can use this sauce for fried tofu, fried squid and many other dishes too. Dice the chicken breast into mouthful sized pieces and lay them on a large plate. Season the chicken with a mix of finely chopped garlic, shallots and parsley adding lemon juice, salt, pepper and the lemon peel. Set the chicken aside for 10 to 20 minutes to marinate. Add 4 tablespoons of Korean frying starch powder (flour) to the marinated chicken and rub it thoroughly over the pieces and leave it for around 7 minutes. Add another 4 tablespoons of flour and rub again then leave them another 5 minutes for the flour to settle into the surface of the chicken. The best flour I found is this brand from my Korean supermarket but normal flour will work. We are going to fry the battered chicken breast pieces three times in total. First deep fry the chicken in batches for 1 or 2 minutes until a light brown in colour. Be careful because the oil will spit if you add too much at once. Then deep fry in batches again for another 2 minutes or until the chicken breast is crisp and golden brown in colour. Try a sample for taste and that it is cooked properly throughout. For the last (and third time) fry again until they are crisp and golden brown. When the chicken is done, reheat the sauce and coat the chicken breast using a wooden spoon. You can serve the chicken half with sauce and half without like in my first picture. Sprinkle some roasted pine nuts (or chopped pistachios) over the top of the sauce and serve immediately.